Mammootty, Sobhana, Rahman in Malaylama movie Kanamarayathu | Mammootty Online.com - All About Malayalam Megastar Mammootty ! Sherly (Shobhana) is an orphan who is sponsored by an old man. 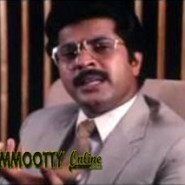 On his death, the sponsorship is continued by his son Roy (Mammootty), who is a rich businessman. But Sherly does not know about him. She comes to College in the city where Roy’s sister is her classmate and she meets Roy still not knowing he is her sponsor. On the other hand Alex (Lalu Alex) introduces his brother Baby (Rahman) to Roy, and on Roy’s advice Baby starts working in his firm. At Mercy’s (Sabitha Anand) birthday party, Baby meets Sherly and falls in love with her, but her mind has already gone for Roy, still without knowing that he is her sponsor, and she rejects Baby. Later Sherly finds that Roy has no feelings for her, although he is secretly in love with her but does not wish to reveal it because of the age gap between them and also because Baby confuses her by lying to her that Roy and Elsie (Seema) were in love for a long time and couldn’t marry because of Roy’s father. Sherly is extremely frustrated at this and in a fit of rage goes to Elsie and lies to her that she is pregnant with Roy’s baby. Elsie is shocked at this and goes to his office and scolds him for his irresponsibility but Roy tells her that it was not him. He calls Sherly to his office and shouts at her thinking that she is pregnant with Baby’s baby and lied to the doctor that she was pregnant with his baby but she tells him that she was lying to break them up and also to prove her love for him and tells him that she cannot live without him. However, Mother Superior tells Roy that she was going to be sent to Italy to learn music and also that she was allowed to become a nun now and on Mother Superior’s (Kaviyoor Ponnamma) advice she decides to became a nun although she doesn’t want to and plans to leave to Italy due to her gratitude towards Mother and her sponsor. So as a final meeting she sees Roy and tells him about this and that she cannot see him anymore. She also meets Baby and tells him everything including that she is an orphan and that she is going to be a nun. He, however, still was willing to marry her but she tells him that she is in love with someone else and he did not accept her so she decided to become a nun. He insists her on telling him who she is and she tells him that it is Roy. At this news he goes to Roy’s office and shouts at him for what he did. But as a last wish she wants to see her unknown sponsor who has blessed her all her life with what she would have never had and so Roy comes to the orphanage revealing that he is the sponsor that was unknown for so long and comforts her by wanting to marry her.